The Cerebral cortex is the most developed part of the human brain and often quoted as the most complicated system and poorly understood system known. The surface is the processing centre comprised of the outer layer of grey matter formed by neuronal cell bodies and their many connections. These are connected with neighbouring areas by axonal extensions which are myelinated and pass to other cortical areas or down and medially as long tracts to brainstem and spinal cord whereas others form circuits within the deep grey matter of the basal ganglia and other structure grey matter structures such as the thalamus or pass to other areas on the cortex. These fibres contain ascending (mainly sensory) and descending signals (mainly motor). The hemispheres surround the fluid filled ventricles. 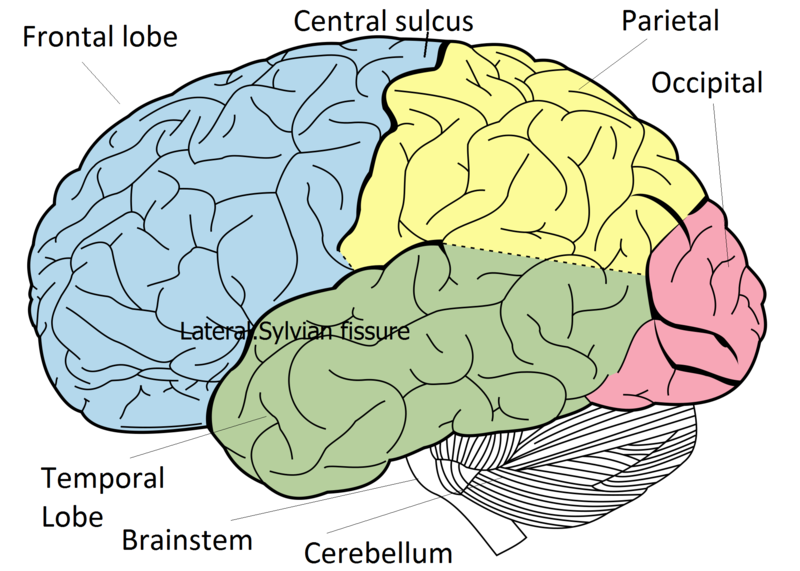 The cerebral hemispheres can be divided by certain sulci on the brain surface into lobes. The surface shows multiple folds - gyri and sulci which increase the amount of grey matter and cortical neurons (processing potential) making up the surface of the brain. It was Broca who showed that different parts of the brain had distinct functions in a patient with a syphilitic lesion in the precentral gyrus and dysphasia. Later others such as Brodmann mapped these areas on their cellular appearance. Let us look at the histology and then the lobes and their function. The Cerebral cortex is the most developed part of the human brain and often quoted as the most complicated system and poorly understood system known. The surface is the processing centre comprised of the outer layer of grey matter formed by neuronal cell bodies and their many connections. These are connected with neighbouring areas by axonal extensions which are myelinated and pass to other cortical areas or down and medially as long tracts going to brainstem and spinal cord whereas others form circuits within the deep grey matter of the basal ganglia and other structure grey matter structures such as the thalamus or pass to other areas on the cortex. The hemispheres also contain fluid filled ventricles. The cerebral hemispheres can be divided by certain sulci on the brain surface into lobes and the folds increase the amount of grey matter making the surface of the brain. It was Broca who was one of the first to show that different parts of the brain had distinct functions. Others such as Brodmann mapped these areas. Let us look at the histology and then the lobes and their function. Histologically the cerebral cortex is made up of a 5mm layer of grey cells above a dense thick inner layer of white matter. The overall surface area is increased by the folds of sulci and gyri. The cortex can be seen to be composed of six layers of cells which vary in size and structure. 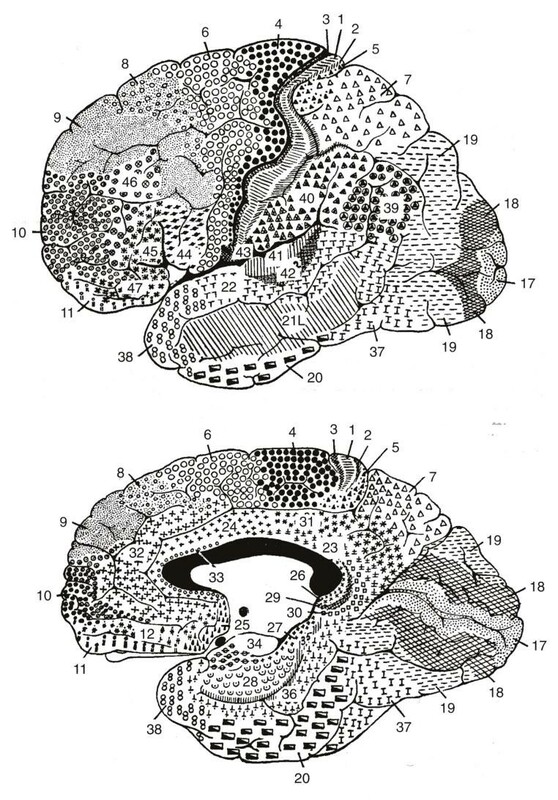 Back in 1909 Brodmann produced a map of the cerebral cortex based on the micro-architecture of the cells and staining for Nissl substance which separates neurons from glial cells. This was before we had understanding of many of the functions of these areas and the system has stood the test of time. Other improvements have been developed by others. It is quite clear that anatomy is related to function. Cells in the cortex are arranged in a columnar structure and can this can be seen with microelectrode stimulation. Areas with similar function lie close together. For example Broca's area lies within the inferior region of the precentral motor cortex near to those areas that control voluntary movement of the lips, tongue, larynx and pharynx. Broca's produces the content of speech content and damage here leads to an expressive dysphasia. A lesion in the inferior area of the precentral motor cortex leads to dysarthria and facial weakness. Broca's discovery of dysphasia in a patient whose subsequent post mortem revealed a lesion due to syphilis in the area that became known as Broca's area was one of the key finding to suggest localization of function within the brain. The fibres from the cortex on their way to the brainstem pass down in a fan like bundle called the corona radiata to enter the internal capsule. The Cerebral cortex is the most developed part of the human brain and often quoted as the most complicated system and poorly understood system known. The surface is the processing centre comprised of the outer layer of grey matter formed by neuronal cell bodies and their many connections. These are connected with neighboring areas by axonal extensions which are myelinated and pass to other cortical areas or down and medially as long tracts to brainstem and spinal cord whereas others form circuits within the deep grey matter of the basal ganglia and other structure grey matter structures such as the thalamus or pass to other areas on the cortex. These fibres contain ascending (mainly sensory) and descending signals (mainly motor). The hemispheres surround the fluid filled ventricles. The cerebral hemispheres can be divided by certain sulci on the brain surface into lobes. The surface shows multiple folds - gyri and sulci which increase the amount of grey matter and cortical neurons (processing potential) making up the surface of the brain. It was Broca who showed that different parts of the brain had distinct functions in a patient with a syphilitic lesion in the precentral gyrus and dysphasia. Later others such as Brodmann mapped these areas on their cellular appearance. Let us look at the histology and then the lobes and their function. For the stroke physician you need to appreciate these anatomical markers on imaging so that you can name the borders of the lobes of the brain on axial, coronla and sagittal planes. The frontal lobe starts at the central sulcus and forwards. Inferiorly limited by the lateral (sylvian) sulcus. The primary motor cortex (MC) lies on the prefrontal gyrus. Input is received from the thalamus and cerebellum and is the main source of all conscious movement. Representation on the lateral surface is hand superiorly and then below that face and tongue and larynx and pharynx. The trunk and leg are represented on the medial inner surface. The Premotor cortex (PMC) lies slightly anterior to MC and is also concerned with voluntary movement. Frontal eye fields lies in front of the PMC and is involved in eye movement. Broca's area (dominant hemisphere) lies inferiorly close to the primary motor areas for mouth, oral cavity and pharynx and larynx. Broca's is involved in generating the content of speech. Damage here causes expressive dysphasia. The Frontal association cortex gets input from thalamus, limbic system, other cortical areas and is involved in intellectual ability. The paracentral lobule found on the medial surface involved with urinary continence. Occipital lobe lies behind the parietal and temporal lobes. Calcarine cortex primarily deals with vision and visual processing. The optic radiations pass back from the lateral geniculate body of the ipsilateral thalamus. Sight from the right side of ones world goes to left occipital cortex. Occipital association areas concerned with image processing. High density of neurons. The main centre for processing is within the calcarine sulcus. Upper fibres from the upper retina pass to the upper calcarine sulcus called the cuneus. Lower fibres pass to the lower part of the sulcus, the lingual gyrus from the lower retina. The visual area is called Brodmann 17 area. This area of grey matter is seen if one parts the lips of the lateral sulcus and is known as the insula. It is closely associated with the middle cerebral artery which passes on the surface. Its functions are poorly understood and possibly involve belching, salivation, gastric movements and vomiting. It may play a role in addiction. The insula certainly is discussed in early stroke imaging 'loss of the insular ribbon sign'. Embryologically the eye is an outgrowth from the diencephalon. The Optic nerve is formed at the rear pole of the eye exiting medially at the blind spot. It is not a peripheral nerve but a nerve tract and myelinated by oligodendrocytes rather than schwann cells. As such it is not vulnerable to peripheral demyelinating neuropathies but can be affected by central demyelinating diseases eg MS. It leaves the orbit through the optic canal passing medially. At the optic chiasma the nasal retinal fibres cross over and temporal retinal fibres stay on the outside. Fibres cross over at the optic chiasma above the pituitary fossa. The tract passes back send most fibres to the lateral geniculate body as well as ipsilateral pretectal nuclei and superior colliculus. On leaving the lateral geniculate body the tract splits into two tracts with an inferior "Meyer's loop" which passes forwards before radiating posteriorly through the temporal lobe along the inferior horn of the lateral ventricle and then to the lower bank of the calcarine sulcus of the occipital cortex and carries information from the inferior retina. The other fibres loop back more directly through the parietal lobe through the retrolenticular part of the internal capsule before passing on to the occipital lobe particularly the upper bank of the calcarine sulcus. A large venous structure carrying blood from the face indeed the most complex venous plexus in the body. Receives blood from inferior and superior ophthalmic veins and anterior temporal veins and drains into the superior and inferior petrosal sinuses. Pathology includes thrombosis which may be due to localised infection or a prothrombotic disorder or a caroticocavernous fistula with pulsatile exophthalmos. It is also a site for meningiomas. This is a right angled shaped tract which carries various ascending and descending myelinated fibres from the cerebral cortex to the thalamus, brain stem and cerebellum as well as basal ganglia structures. It is sandwiched between the structures of the basal ganglia which is a collection of neuronal cell bodies involved in motor function. Contains a high density of ascending and descending tracts fibres. Small ischaemic lesions or bleeds can cause significant deficits. The volume of damage in the primary motor cortex to give a weak arm and face would be much greater than a small lesion in the posterior limb of the internal capsule. Anatomically it can be said to have four parts. On a horizontal section or axial view on MRI it can be seen to have an almost half X shape. Anterior limb:between lentiform nucleus ( composed of the Globus Pallidus medially and the Putamen laterally) and head of caudate nucleus medially. It contains ascending thalamocortical and descending corticothalamic fibres connecting lateral thalamic nuclei and the cortex. Fibres from cortex to pons also travel within the anterior limb. Supplied by medial striate branches of the anterior cerebral artery and lateral striate branches of the middle cerebral artery. Genu:the knee or bend in the L shape which points medially. Contains corticobulbar fibres. Supplied by branches of the anterior choroidal artery or direct from internal carotid. Posterior limb: thalamus medially and lentiform nucleus laterally. Carries the clinically important descending corticobulbar and corticospinal tract from the precentral gyrus. Also carries ascending 3rd order sensory fibres from the thalamus to the post central gyrus. Supplied by anterior choroidal and lenticulostriate arteries. Retrolentiform: part where it extends past the lentiform nucleus. May contain some visual radiations and auditory fibres. Vascular supply to the internal capsule is by small right angled penetrating arteries of the MCA called the lateral striate (lenticulostriate) arteries and the more anterior aspects including anterior limb by branches of the anterior choroidal artery (a branch of the ICA). The basal ganglia is a collection of interconnected nuclei (neuronal cell bodies) lying deep below the cortex. It is composed of the following structures. The putamen (laterally) and globus pallidus (medially) form the lenticular or lentiform nucleus (lens shaped). The caudate and putamen are also called the neostriatum. Grey matter strands cross the internal capsule to connect these structures and so gives the area the name of the corpus striatum. The putamen is the larger ovoid mass which lies laterally with its lateral side separated very slightly from insular cortex and the external capsule and claustrum. Medially attached to the Globus Pallidus. The Globus Pallidus is smaller triangular shaped structure and lies medially with its medial relation being the internal capsule. The globus pallidus is a major source of output from the basal ganglia. It is divided by a lamina into Globus pallidus externa and interna.